So you need experience to have a good chance of securing that longed-for graduate job… But to get an internship, you have to write an application. In this blog post our student blogger, Rebekah Billingham, talks you through how the Careers Centre has helped her get to grips with applications. Once I came to terms with the fact that I needed to apply for internships, I had to figure out where to start. Still finding my feet in my second ever semester at uni is challenging enough, let alone getting down to the nitty gritty of job applications, which is another thing I’m pretty inexperienced with. The Careers Centre has been a life saver in more ways than one. Having taken advantage of a lot of their services, I feel like I’m finally getting somewhere. At a spontaneous drop-in session, one of the Careers Advisors introduced me to the Leeds Internship Programme, which is exclusively for University of Leeds students in any year of study. These opportunities are provided by University departments, along with lots of different small-to-medium sized companies and charities around the Leeds area. All you have to do is sign up to the programme. Once you do, you will recieve email updates containing links to opportunities as they come up. On each email I got, there were at most, four opportunities. The links take you to a detailed but easy to negotiate job description. So far, I’ve been sent four marketing/communications related opportunities which are perfect for me, as they involve a lot of blogging and article writing. The Careers Centre website had loads of downloadable sample CVs and covering letters for a variety of industries. You can choose from a traditional CV and a skils based one for if, like me, you don’t have much of an employment history. This allows you to display the relevant skills you’ve gained through volunteering, your studies, or any achievements you’ve gained elsewhere. These samples have been extremely useful to me when figuring out how to approach applications, especially as the closest I’ve come to a covering letter is my personal statement for my uni application! I made sure to tailor my applications to the job descriptions, and the skills they require, as well as the type of work that would be carried out on the placement by going through each requirement one by one, like a checklist. The drop-in sessions at the Careers Centre have been very useful to me so far, whilst finishing off and perfecting my applications. You can come in at any time between 9-4 weekdays, and an Adviser will talk with you about what it is you need help with. I wanted to make sure my applications were of the highest possible standard, and that I hadn’t left out anything important. I was encouraged to hear that my covering letters were ideal as a result of the close attention I have been paying to the job descriptions. I was advised, however, to include a paragraph about the company itself, to show that I was really interested in the company, and had researched thoroughly. The Adviser also suggested that I include more detailed examples of how I have used the skills I have mentioned, as well as including links to my articles and blogs, including this one. Once I had added those final touches, my applications were ready to be sent. Now to repeat the cycle! 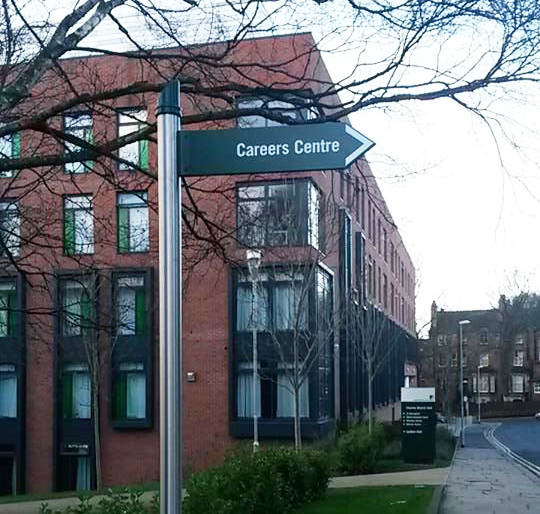 Whatever stage you’re at, please take full advantage of the Careers Centre and all they have to offer. The service is friendly, professional and tailored to the individual. Even if you haven’t the faintest idea of what you want to do, they can help you to identify your strengths and interests. Remember, it’s never too early to get started.